The Dengvaxia fiasco is just a symptom of a deeper malady of the US-modeled health care system which is driven by market forces rather than by people’s actual health needs. This illustrates starkly the danger of putting health in the hands of profit makers rather than putting health in the hands of the people. In fact, this is an inevitable consequence of corporate globalization pushed by the US and enthusiastically promoted by government and big business. Having been hijacked by big business, the prevailing health system relied mainly on the initiatives of transnational drug companies to develop a dengue vaccine, which has been mistakenly perceived by reductionist scientific minds as the best option of controlling a complex infectious disease like dengue. As a consequence, profit became the primary driving factor in addressing a public health problem. It is not surprising, therefore, that Sanofi-Pasteur, the manufacturer of Dengvaxia, seeing multibillon-dollar profits within reach and under pressure by neoliberal business competition, pushed hard for the approval and use of their product despite the obvious lack of scientific and commonsensical justification. 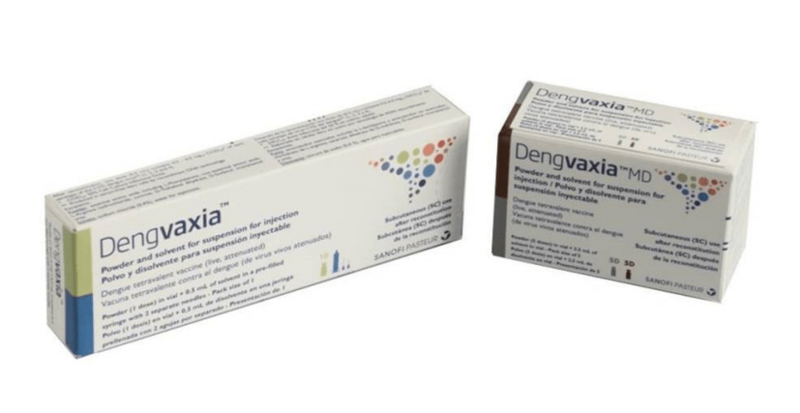 In an obvious effort to fast-track Dengvaxia, Sanofi-Pasteur made premature and exaggerated claims of safety and efficacy citing mainly clinical trials in Asia and Latin America which they themselves sponsored and with their scientists directly involved in the studies.1 http://www.sanofipasteur.com/en/articles/sanofi-pasteur-dengue-vaccine-approved-in-the- philippines.aspx 2Coudeville L; Baurin N; L’Azou M; Guy B. Potential impact of dengue vaccination: Insights from two large-scale phase III trials with a tetravalent dengue vaccine. Vaccine. 2016; 34(50):6426-6435. This fact alone should have been a red flag for governments to be skeptical about claims of safety and efficacy by the manufacturer, especially with respect to dengue vaccine. For the past several decades, the development of a dengue vaccine has been largely unsuccessful because of the complexity of dengue and due to various conceptual and technical problems.3Usa Thisyakorn and Chule Thisyakorn.Latest developments and future directions in dengue vaccines.Ther Adv Vaccines. 2014; 2(1) 3-9.4Thomas SJ and Rothman AL. Trials and tribulations on the path to developing a dengue vaccine.Vaccine.2015 Nov 27;33 Suppl 4:D24-31. Claims that a “good” dengue vaccine has been found which can now be used for mass vaccination should therefore be treated with extreme caution, particularly if claims are made by Big Pharma with a proven history of fraud, false claims and other forms of criminal behaviour in the past.5https://www.cnbc.com/2015/11/20/sanofi-whistleblower-lawsuit-kicks-into-higher-gear.html6https://healthimpactnews.com -Gardasil Vaccine: Spain Joins Growing List of Countries to File Criminal Complaints7https://www.outlookindia.com/magazine/story/pharma-money-is-corrupting-paediatrics- academy/2987208https://www.citizen.org/our-work/health-and-safety/twenty-five-years-pharmaceutical-industry- criminal-and-civil-penalties-1991-through-2015 It is no secret that Big Pharma often manipulate or deliberately mis-interpret results of studies which they sponsor to be consistent with their corporate interest. The danger of premature approval and use of dengue vaccine for mass inoculation was in fact pointed out earlier by reputable scientists based on various scientific studies which showed serious potential adverse effects, among which are various effects on the immune system, including what has been called “antibody-dependent enhancement,” which may lead to the occurrence of severe dengue disease.9Ubol S and Halstead SB. How Innate Immune Mechanisms Contribute to Antibody-Enhanced Viral Infections. Clinical and Vaccine Immunology, Dec 2010, Vol. 17, No. 12, p. 1829–183510Halstead SB and O’rourke EJ. Infection Enhancement by non-neutralizing antibody.The Journal of Experimental Medicine, Vol 146, 1977.11Halstead SB. Identifying protective dengue vaccines: Guide to mastering an empirical process. Vaccine. 2013, 31:4501– 4507.12Ferguson NM, Barraquer IR, Dorigatti I, Teran-Romero LM, Laydon DJ, Cummings DAT. Benefits and risks of the Sanofi-Pasteur dengue vaccine: Modeling optimal deployment. Science 02 Sep 2016:Vol. 353, Issue 6303, pp. 1033-1036.13Katzelnick LC, Gresh L, Elizabeth Halloran E, Mercado JC, Kuan G, Gordon A, Balmaseda A, Harris E. Antibody-dependent enhancement of severe dengue disease in humans. Science 17 Nov 2017 : 929-932. 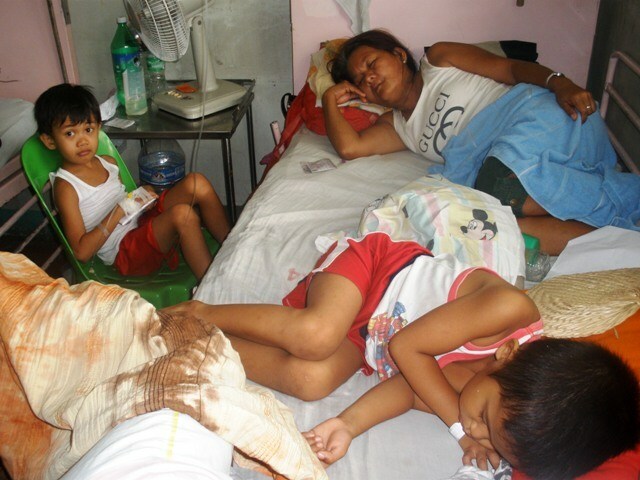 14https://finance.yahoo.com/news/did-sanofi-ignore-warning-signals-022143151.html Some have disputed the exaggerated interpretation and misrepresentation of the results of the Dengvaxia clinical trial data by Sanofi-Pasteur and also the analysis and recommendations of the WHO based on the same industry-sponsored studies.15Aguiar M, Stollenwerk N, Halstead SB.The Impact of the Newly Licensed Dengue Vaccine in Endemic Countries. PLoS Negl Trop Dis 2016:10(12).16Halstead SB, Russell PK.Protective and immunological behavior of chimeric yellow fever dengue vaccine.Vaccine. 2016 Mar 29;34(14):1643-7.17Dans AL, Dans LF, Lansang MAD, Silvestre MAA, Guyatt GH. Review of a licensed dengue vaccine: Inappropriate subgroup analyses and selective reporting may cause harm in mass vaccination programs. Journal of Clinical Epidemiology. Nov24,2017. Several other scientists and concerned medical doctors and professionals have also questioned the efficacy of several vaccines and have warned repeatedly on the significant risks associated with vaccination. In fact, numerous studies support these allegations of questionable safety and unacceptable risks. 18Committee on the Effects of Multiple Immunizations, National Research Council. Effects of Long- term Immunization with Multiple Antigens: Final Report. U.S.Army Medical Research and Development Command. Fort Detrick, Frederick, Maryland 21701. January 1980.19Institute of Medicine. 2012. Adverse Effects of Vaccines: Evidence and Causality. Washington, DC: The National Academies Press. https://doi.org/10.17226/13164.20http://www.nvic.org/pdfs/iom/nvic-stmt-2011-aefi-rpt.aspx. Statement of the National Vaccine Information Center (NVIC) on “Adverse Effects of Vaccines: Evidence and Causality” published by the Institute of Medicine Committee to Review Adverse Effects of Vaccines: Evidence and Causality. August. 25, 2011.21Suzanne Humphries, MD & Roman Bystrianyk. Dissolving Illusions: Disease, Vaccines, and the Forgotten History. CreateSpace Independent Publishing, 2014.22Deisher TA, Doan Ngoc V, Omaiye A, Koyama K and Bwabye S. Impact of environmental factors on the prevalence of autistic disorder after 1979. Journal of Public Health and Epidemiology. Vol. 6(9), pp. 271-284, September 2014.23http://preventdisease.com/news/pdf/Research_Citations_Linking_Vaccines_To_Disease.pdf. Despite the fact that vaccines do stimulate the production of specific antibodies, vaccines may in fact be destroying the coordinated and total immune system response to an infection, contrary to what has been claimed that vaccines strengthen the immune system. Several published scientific studies have shown the adverse effects of various types of vaccines on the immune system of vaccinated individuals, especially infants and children.24Stratton K, Wilson CB and McCormick MC, Editors. Immunization Safety Review: Multiple Immunizations and Immune Dysfunction. Immunization Safety Review Committee, Board on Health Promotion and Disease Prevention, Institute of Medicine. National Academy Press. Washington, D.C.2002.25Jaber, L., Shohat, M., Mimouni, M. Infectious episodes following diphtheria-pertussis-tetanus vaccination: a preliminary observation in infants. Clinical Pediatrics 1988; 27:491-494.26Kemp, Trudi; Pearce, Neil; Fitzharris, Penny; et al. Results of the Christchurch Health and Development Study. Epidemiology 1997, 8:678.27Stanley, S.K., Ostrowski, M.A., Justement, J.S., et al. Effect of immunization with a common recall antigen on viral expression in patients infected with human immunodeficiency virus type 1.New England Journal of Medicine 1996; 334:1222-1230.28Sutter, R.W., Patriarca, P.A., Suleiman, A.J.M. et al. Attributable risk of DTP (diphtheria and tetanus toxoids and pertussis vaccine) injection in provoking paralytic poliomyelitis during a large outbreak in Oman. Journal of Infectious Disease 1992; 165:444-449.29Nakayama, T., Urano, T., Osano, M., et al. Long-term regulation of interferon production by lymphocytes from children inoculated with live measles virus vaccine. Journal of Infectious Diseases 1988; 158:1386-1390.30Neustaedter R. Vaccines and Immune System Damage. http://icpa4kids.org/HPA-Articles/vaccines- and-immune-system-damage/All-Pages.html. It has been demonstrated in laboratory studies, for example, that a vaccine can weaken the immune system and this finding has been corroborated by clinical studies that showed an increase in the incidence of serious illnesses following vaccination of children as compared to the incidence in the absence of vaccination. Many of these illnesses may manifest only much later and by then, the vaccine may not even be suspected as a causative factor. The inherent danger of injecting microbial protein fragments, DNA and other foreign materials into the human body, especially in children, is well documented in the scientific literature.31Koyama K and Deisher TA. Spontaneous Integration of Human DNA Fragments into Host Genome. Sound Choice Pharmaceutical Institute, Seattle, WA. https://www.scribd.com/document/341942388/DNA-Contaminants-in-Vaccines-Can-Integrate- Into-Childrens-Genes.32Trost B, Lucchese G, Stufano A, Bickis M, Kusalik A and Darja Kanduc D. No human protein is exempt from bacterial motifs, not even one. Self/Nonself 1:4, 328-334; Oct-Dec 2010.33Crépeaux G, Eidi H, David MO, Baba-Amer Y, Tzavara E, Giros B, Authier FJ, Exley C, Shaw CA, Cadusseau J and Gerardi RK. Non-linear dose-response of aluminium hydroxide adjuvant particles:Selective low dose neurotoxicity. 2016:Toxicology 375(2017);48–57.34Palevsky LB. Aluminum and Vaccine Ingredients:What Do We Know? What Don’t We Know? http://www.nvic.org/Doctors-Corner/Lawrence-Palevsky/Aluminum-and-Vaccine-Ingredients.aspx. Dengvaxia, and in fact, all vaccines, contain such hazardous foreign fragments and materials. One particularly hazardous material used in vaccines as adjuvant is aluminum, a known neurotoxic agent. Mercury, another neurotoxicant implicated in neurodevelopmental disorders, is still present in some vaccine preparations, particularly in flu vaccine. In the Dengvaxia vaccine, there is very little information about potentially hazardous foreign materials present in the vaccine. Trometamol, an alkalinizing agent used in various industrial products and cosmetics, is listed by Sanofi-Pasteur as an ingredient but with very little toxicologic information available. What is more of concern is that the Dengvaxia vaccine is produced through genetic engineering technology with uncertain but potentially serious hazards.35http://www.dogsnaturallymagazine.com/genetically-engineered-vaccines-2/36Lee H-C, Yen Y-T, Chen W-Y, Wu-Hsieh BA, Wu S-C (2011) Dengue Type 4 Live-Attenuated Vaccine Viruses Passaged in Vero Cells Affect Genetic Stability and Dengue-Induced Hemorrhaging in Mice. PLoS ONE 6(10): e25800. doi:10.1371/journal.pone.0025800.37http://www.i-sis.org.uk/HPV_Vaccine_Production_Plants.php38Potential Biohazards of Recombinant DNA Molecules. Committee Report on Recombinant DNA Molecules. Proc. Nat. Acad. Sci. USA 71 (1974). Even if a vaccine candidate is deemed essential in addressing the problem of Dengue, a rigorous safety assessment, including adequate, randomized, and placebo-controlled clinical trials must be undertaken and an honest-to-goodness risk-benefit assessment must be performed before any mass vaccination can be done. Adherence to the precautionary principle is a must, especially if lots of people are expected to be exposed to the invasive vaccination procedure. It is evident that in the Dengvaxia case, such precautionary assessment was not done properly. Even the fundamental ethical principle “First do no harm” was clearly not in the minds of those who pushed for the Dengvaxia vaccine. Fundamental questions, however, need to be asked in relation to this Dengvaxia fiasco. What about the other vaccines already being administered in the expanded immunization program of government? Are they really safe and effective? Have they undergone rigorous scientific assessment as normally required? Are the results credible given the fact that regulatory agencies rely on vaccine industry submitted data for registration and approval? Is vaccination the best approach in addressing the targetted infectious diseases? Have plausible alternatives been adequately explored and tested? The issue of vaccination is quite complicated and controversial in many respects and most doctors actually were not well educated about it. Doctors just accepted what limited information was taught to them in medical school and went along with the dogma that vaccines are necessary, safe and effective, without really thinking much about it. Most health professionals accepted the assertion that vaccines saved the lives of millions of people from dying of infectious diseases such as smallpox, polio, pertussis, etc. without examining the scientific evidence behind the assertion. However, on closer scrutiny, one would find that the deaths from common infectious diseases in developed countries declined quite remarkably since the 1900s until the 1950s and 1960s even before vaccines were introduced to combat these diseases. Significant improvements in socio-economic development, nutrition, public sanitation and other social determinants of health were shown convincingly to be mainly responsible for the decline in mortality.39Bystrianyk R. Vaccines and Disease: An investigative Report. November 18, 2002. http://www.whale.to/a/bystrianyk3.html. Claims of vaccine efficacy were grossly exaggerated, data manipulated, and adverse effects concealed from the public and in in many instances, vaccination campaigns resulted in disastrous results. 40Hadwen, Walter. The Case Against Vaccination. Public Address. Jan.25, 1896. Gloucester. http://whale.to/v/hadwen.html41https://www.youtube.com/watch?v=KtN0PMJOOjM Immunity, Infectious Disease, and Vaccination – Raymond Obomsawin42https://www.youtube.com/watch?v=_KhofzZ-ke8 Herd Immunity Measles- Dr. Suzanne Humphries43Scheibner V. Measles Vaccines Part I: Ineffectiveness of Vaccination and Unintended Consequences. International Medical Council on Vaccination Jan. 18, 2013.44http://www.scoop.co.nz/stories/GE0611/S00006.htm45https://www.westonaprice.org/health-topics/environmental-toxins/pesticides-and-polio-a-critique- of-scientific-literature/46Swanson NL, Leu A, Abrahamson J, Wallet B (2014) Genetically engineered crops, glyphosate and the deterioration of health in the United States of America. Journal of Organic Systems 9. We are often told that vaccines have been adequately tested for safety before approval, that the adverse effects from vaccines are minor and that serious adverse effects are extremely rare. However, looking at some other official reports and available medical literature, another picture emerges. For example, according to the US Health and Human Services, 3,887 compensation awards have been paid since the first claims for vaccine injury were filed in 1989.47Sharockman. A on Tuesday, What CDC statistics say about vaccine-related illnesses, injuries and death. February 3rd, 2015. http://www.politifact.com/punditfact/statements/2015/feb/03/bob- sears/what-cdc-statistics-say-about-vaccine-illnesses-in/. The vaccine compensation program requires evidence of cause and effect relationship between vaccine and the claimed injury, requiring hearings that usually take several years. The rulings, however, are decided in a court of law and no definitive conclusion of cause and effect relationship is established. It is also very hard for the claimants to prove cause and effect and as a consequence, majority of the claims (9,860 cases) were dismissed. It must also be pointed out that only between 1 and 10 percent of serious health problems that occur after use of prescription drugs or vaccines in the U.S. are ever reported. Contrary to constantly repeated claims by the government, the medical establishment and the pharmaceutical industry, vaccines have never been proven to be safe by the gold standard of medical research: A double-blind, randomised placebo controlled investigation. On the other hand, there are thousands of scientific reports and case studies that do claim adverse effects due to various types of vaccines. In the 2012 report of the US Institute of Medicine (IOM),48Institute of Medicine. 2012. Adverse Effects of Vaccines: Evidence and Causality. Washington, DC: The National Academies Press. https://doi.org/10.17226/13164. 12,000 peer-reviewed studies on vaccine adverse effects were reviewed using very strict criteria not only in selecting published studies but also in the determination of causality. While seemingly adhering to scientific rigor and objectivity, symptoms of systemic bias are readily apparent upon closer scrutiny of the report. For example, in the introduction, the committee stated, “The overwhelming safety and effectiveness of vaccines in current use in preventing serious disease has allowed them to gain their preeminent role in the routine protection of health. Before an immunization is introduced for population-wide use, it is tested for efficacy and safety.” This statement immediately reflects a tendency to prefer or predict a result based on a previous perception of truth. A more obvious bias appears in their selection of studies deemed to be qualified according to their criteria. An illustrative example is their selection of studies looking into the association of MMR vaccine and autism. Among several studies available in the scientific literature relevant to the issue of MMR vaccine and autism, the committee reviewed only 22 studies to evaluate the risk of autism after the administration of MMR vaccine. Of the 22, only five were deemed qualified to contribute to the weight of evidence assessment and in all of these five “qualified” studies, the conclusion was that there was no evidence to show that MMR vaccine was associated with autism. The committee then concluded that “The evidence favors rejection of a causal relationship between MMR vaccine and autism.” A closer scrutiny of the five “qualified” studies, however, reveals that all studies are stacked with authors with serious conflicts of interest and some are of questionable integrity. One senior author, who was an overseer of US Center for Disease Control-funded studies showing no evidence of MMR vaccine and autism connection, was accused of fraud and data manipulation and was criminally indicted in the US. Nevertheless, in their review of all the reported adverse events, the IOM committee concluded that the evidence “convincingly supports” 14 and “favors acceptance” of four vaccine–adverse event relationships. The adverse events identified include anaphylaxis, encephalitis, meningitis, disseminated viral infection, pneumonia, hepatitis, febrile seizures, deltoid bursitis, arthralgia, syncope and oculorespiratory syndrome. However, for the majority (140) of vaccine-related adverse events reviewed, including immune system disorders and neurodevelopmental disorders (other than autism), the committee ruled that there was inadequate evidence to conclude whether or not vaccines caused the adverse events. The committee then noted that the report was not intended to answer the question “Are vaccines safe?” and that where the committee has found evidence of a causal relationship, it does not make conclusions about the rate or incidence of these adverse effects. Interestingly, a related Institute of Medicine report in 2013 on “Childhood Immunization Schedule and Safety”49Institute of Medicine. 2013. The childhood immunization schedule and safety: Stakeholder concerns, scientific evidence, and future studies.Washington, DC: The National Academies Press. stated that, “No studies have compared the differences in health outcomes that some stakeholders questioned between entirely unimmunized populations of children and fully immunized children. Experts who addressed the committee pointed not to a body of evidence that had been overlooked but rather to the fact that existing research has not been designed to test the entire immunization schedule.” Yet, at the same time, this IOM report recommended that “The Department of Health and Human Services should refrain from initiating randomized controlled trials of the childhood immunization schedule that compare safety outcomes in fully vaccinated children with those in unvaccinated children or those vaccinated by use of an alternative schedule.” This seems to validate the oft-repeated criticism that the industry dominated research agenda deliberately avoids looking at the true picture of vaccine efficacy and safety by avoiding studies of such nature that would really test the safety and efficacy of the entire immunization schedule. This glaring gap in the body of scientific research on vaccines also underscores the importance of truly independent research which has long been neglected by governments and international bodies such as the World Health Organization (WHO). 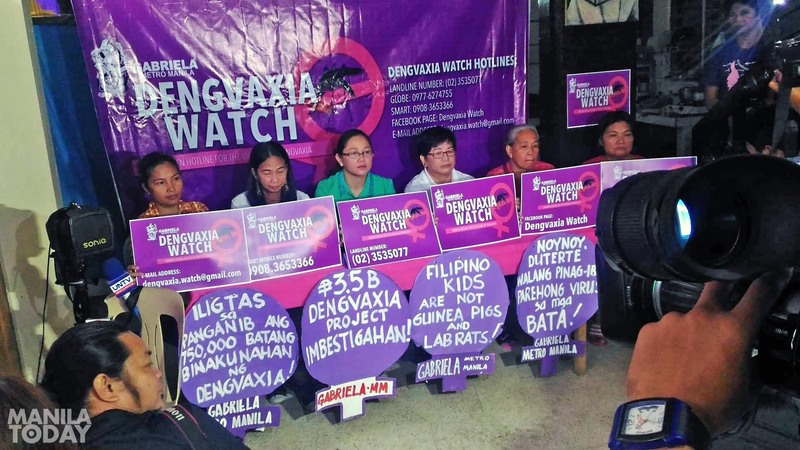 Women’s group Gabriela launches Dengvaxia watch to monitor cases of severe dengue possibly caused by the dengue vaccine in communities. File Photo by Manila Today. The question of safety, however, should be foremost in the minds of program implementors, policy makers and those who influence them, including international organizations. It is unacceptable on both ethical and scientific grounds to rush a potentially dangerous invasive intervention on the population no matter how good the intentions are. Naive and neoliberalism adherent governments, particularly the Philippine government, easily succumbed to the lobbying efforts of Big Pharma to fast-track the approval of Dengvaxia. As a result, about 830,000 Filipino children were injected with Dengvaxia vaccine with a false promise of protection and safety but instead are now more at risk of developing severe adverse effects (including hemorrhage and death) compared to not being injected at all. 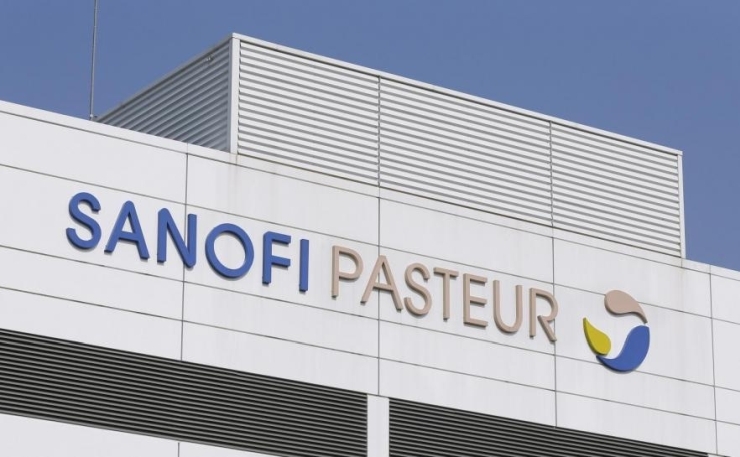 Sanofi-Pasteur and government officials involved in the hasty mass injection of a dangerous vaccine are now desperately trying to extricate themselves from potential criminal liability. At the very least, those responsible should be charged, particularly Sanofi-Pasteur, with unethical human experimentation and violation of human rights as provided for by various international human rights instruments. The WHO can be considered as accessory to this crime because it basically recommended the use of Dengvaxia for mass vaccination despite obvious warnings of serious risks especially under conditions of use in developing countries. For medical and health professionals, it is time to rethink the reductionist, corporate driven vaccination dogma. 2. Coudeville L; Baurin N; L’Azou M; Guy B. Potential impact of dengue vaccination: Insights from two large-scale phase III trials with a tetravalent dengue vaccine. Vaccine. 2016; 34(50):6426-6435. 3. Usa Thisyakorn and Chule Thisyakorn.Latest developments and future directions in dengue vaccines. Ther Adv Vaccines. 2014; 2(1) 3-9. 4. Thomas SJ and Rothman AL. Trials and tribulations on the path to developing a denguevaccine. Vaccine. 2015 Nov 27;33 Suppl 4:D24-31. 9. Ubol S and Halstead SB. How Innate Immune Mechanisms Contribute to Antibody-Enhanced Viral Infections. Clinical and Vaccine Immunology, Dec 2010, Vol. 17, No. 12, p. 1829–1835. 10. Halstead SB and O’rourke EJ. Infection Enhancement by non-neutralizing antibody.The Journal of Experimental Medicine, Vol 146, 1977. 11. Halstead SB. Identifying protective dengue vaccines: Guide to mastering an empirical process. Vaccine. 2013, 31:4501– 4507. 12. Ferguson NM, Barraquer IR, Dorigatti I, Teran-Romero LM, Laydon DJ, Cummings DAT. Benefits and risks of the Sanofi-Pasteur dengue vaccine: Modeling optimal deployment. Science 02 Sep 2016:Vol. 353, Issue 6303, pp. 1033-1036. 13. Katzelnick LC, Gresh L, Elizabeth Halloran E, Mercado JC, Kuan G, Gordon A, Balmaseda A, Harris E. Antibody-dependent enhancement of severe dengue disease in humans. Science 17 Nov 2017 : 929-932. 15. Aguiar M, Stollenwerk N, Halstead SB.The Impact of the Newly Licensed Dengue Vaccine in Endemic Countries. PLoS Negl Trop Dis 2016:10(12). 16. Halstead SB, Russell PK.Protective and immunological behavior of chimeric yellow fever dengue vaccine. Vaccine. 2016 Mar 29;34(14):1643-7. 17. Dans AL, Dans LF, Lansang MAD, Silvestre MAA, Guyatt GH. Review of a licensed dengue vaccine: Inappropriate subgroup analyses and selective reporting may cause harm in mass vaccination programs. Journal of Clinical Epidemiology. Nov24,2017. 18. Committee on the Effects of Multiple Immunizations, National Research Council. Effects of Long-term Immunization with Multiple Antigens: Final Report. U.S.Army Medical Research and Development Command. Fort Detrick, Frederick, Maryland 21701. January 1980. 21. Suzanne Humphries, MD & Roman Bystrianyk. Dissolving Illusions: Disease, Vaccines, and the Forgotten History. CreateSpace Independent Publishing, 2014. 22. Deisher TA, Doan Ngoc V, Omaiye A, Koyama K and Bwabye S. Impact of environmental factors on the prevalence of autistic disorder after 1979. Journal of Public Health and Epidemiology. Vol. 6(9), pp. 271-284, September 2014. 24. Stratton K, Wilson CB and McCormick MC, Editors. Immunization Safety Review: Multiple Immunizations and Immune Dysfunction. Immunization Safety Review Committee, Board on Health Promotion and Disease Prevention, Institute of Medicine. National Academy Press. Washington, D.C.2002. 25. Jaber, L., Shohat, M., Mimouni, M. Infectious episodes following diphtheria-pertussis-tetanus vaccination: a preliminary observation in infants. Clinical Pediatrics 1988; 27:491-494. 26. Kemp, Trudi; Pearce, Neil; Fitzharris, Penny; et al. Results of the Christchurch Health and Development Study. Epidemiology 1997, 8:678. 27. Stanley, S.K., Ostrowski, M.A., Justement, J.S., et al. Effect of immunization with a common recall antigen on viral expression in patients infected with human immunodeficiency virus type 1. New England Journal of Medicine 1996; 334:1222-1230. 28. Sutter, R.W., Patriarca, P.A., Suleiman, A.J.M. et al. Attributable risk of DTP (diphtheria and tetanus toxoids and pertussis vaccine) injection in provoking paralytic poliomyelitis during a large outbreak in Oman. Journal of Infectious Disease 1992; 165:444-449. 29. Nakayama, T., Urano, T., Osano, M., et al. Long-term regulation of interferon production by lymphocytes from children inoculated with live measles virus vaccine. Journal of Infectious Diseases 1988; 158:1386-1390. 30. Neustaedter R. Vaccines and Immune System Damage. http://icpa4kids.org/HPA-Articles/vaccines-and-immune-system-damage/All-Pages.html. 31. Koyama K and Deisher TA. Spontaneous Integration of Human DNA Fragments into Host Genome. Sound Choice Pharmaceutical Institute, Seattle, WA. https://www.scribd.com/document/341942388/DNA-Contaminants-in-Vaccines-Can-Integrate-Into-Childrens-Genes. 32. Trost B, Lucchese G, Stufano A, Bickis M, Kusalik A and Darja Kanduc D. No human protein is exempt from bacterial motifs, not even one. Self/Nonself 1:4, 328-334; Oct-Dec 2010. 33. Crépeaux G, Eidi H, David MO, Baba-Amer Y, Tzavara E, Giros B, Authier FJ, Exley C, Shaw CA, Cadusseau J and Gerardi RK. Non-linear dose-response of aluminium hydroxide adjuvant particles: Selective low dose neurotoxicity. 2016:Toxicology 375(2017);48–57. 34. Palevsky LB. Aluminum and Vaccine Ingredients:What Do We Know? What Don’t We Know? http://www.nvic.org/Doctors-Corner/Lawrence-Palevsky/Aluminum-and-Vaccine-Ingredients.aspx. 36. Lee H-C, Yen Y-T, Chen W-Y, Wu-Hsieh BA, Wu S-C (2011) Dengue Type 4 Live-Attenuated Vaccine Viruses Passaged in Vero Cells Affect Genetic Stability and Dengue-Induced Hemorrhaging in Mice. PLoS ONE 6(10): e25800. doi:10.1371/journal.pone.0025800. 38. Potential Biohazards of Recombinant DNA Molecules. Committee Report on Recombinant DNA Molecules. Proc. Nat. Acad. Sci. USA 71 (1974). 39. Bystrianyk R. Vaccines and Disease: An investigative Report. November 18, 2002. http://www.whale.to/a/bystrianyk3.html. 43. Scheibner V. Measles Vaccines Part I: Ineffectiveness of Vaccination and Unintended Consequences. International Medical Council on Vaccination Jan. 18, 2013. 46. Swanson NL, Leu A, Abrahamson J, Wallet B (2014) Genetically engineered crops, glyphosate and the deterioration of health in the United States of America. Journal of Organic Systems 9. 49. Institute of Medicine. 2013. The childhood immunization schedule and safety: Stakeholder concerns, scientific evidence, and future studies.Washington, DC: The National Academies Press. Romeo F. Quijano, M.D. is a retired professor of the Department of Pharmacology and Toxicology, College of Medicine, University of the Philippines Manila. He is president of Pesticide Action Network- Philippines. He was the co-chair of the International POPs Elimination Network, bureau member of the International Assessment of Agricultural Science and Technology for Development, and standing committee member of the Intergovernmental Forum on Chemical Safety.